Pablo Picasso once said, “art washes away from the soul the dust of everyday life,” while Albert Einstein said that “creativity is intelligence having fun.” Truer words were never more spoken. Art by its simplest definition is a creative form of communication, a way of communicating ideas, feelings, thoughts, and observations. And here on the Gulf Coast, we are invited to participate in two great theatrical performances of art this week. The Emerald Coast Theatre Company is performing Sylvia, a romantic comedy about a marriage and dog. A middle-aged New York couple’s world is turned upside down when the husband brings home a fetching dog found in Central Park. Tickets are still available for shows on March 1st-March 4th. Do not miss this opportunity to see the area’s best performers! 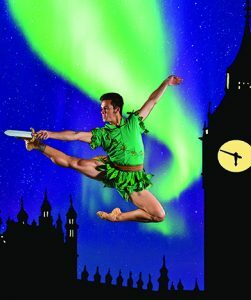 Next up, the Northwest Florida Ballet is performing Peter Pan as its final main stage production of the 2017-2018 season. This production, complete with breathtaking sets, dazzling costumes, international guest artists and company members, takes flight on Friday, March 3rd at 7:30 and on Saturday, March 4th at 2:30 at the Mattie Kelly Arts Center. Peter Pan is presented by Emerald Coast Magazine and Silver Sands Premium Outlets. Peter Pan is the story about a mischievous boy who refuses to grow up. He takes Wendy, John, and Michael on a spectacular journey to Neverland where they encounter the terrifying Captain Hook, pirates, mermaids and one feisty little fairy named Tinker Bell.